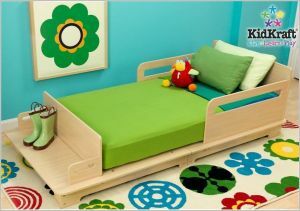 A Kidkraft Modern Toddler Bed is a beautiful, low-profile toddler bed built on simple, modern lines. It’ll fit in perfectly with a home and nursery decorated in the clean, no-nonsense manner that represent modern style, and it’ll make a good transitional bed for a child moving from a crib to, eventually, a larger twin. The Kidkraft Modern Toddler Bed fits all of those criteria. It’s very low to the ground; lower even than most other toddler beds on the market. This means that even a petite toddler can climb in and out easily, and should he or she happen to fall out by accident, won’t get hurt. There are nice solid rails, too, on both sides of the bed; they make it less likely your toddler will roll out at night. The bed is sturdy; although it is meant for a toddler to sleep on, there shouldn’t be any problem if mom or dad need to get on for some midnight comforting after a nightmare. The mattress is supported by a sturdy MDF board, no slats, so even if your little guy likes to jump on it you should be safe. Probably mom and dad shouldn’t try jumping on it, though: even sturdiness has its limits. The official weight limit is just 50 pounds. One nice feature is the little ledge or bench at the foot-end of the bed. If your toddler likes a place to sit while he takes off his shoes or slippers, this might be perfect for that; otherwise, use it as a bookshelf for favorite bedtime stories. Then you have them right there where you want them, ready to read to your toddler. If you happen to have a longer crib-width mattress, you can also take out the slat separating the bench and bed and you’ll have a bed that can be used for much longer. When so many of the toddler beds on the market are decked out with cartoon decals or made in whimsical shapes, it’s nice to find a bed so completely neutral. Even the color is a basic natural wood; something that will work beautifully with almost any toddler bedding set. This transitional bed can be used with equal appropriateness for either boys or girls, so it is a good choice if you’re hoping to use it for both your current toddler and any future siblings. What are the cons of this stylish toddler bed? Although it looks like a beautiful hardwood bed, it’s actually made of manufactured wood (medium density fiberboard, or MDF). The MDF looks good, and it’s sturdy, so maybe it doesn’t matter. If real wood furniture is something you care about, though, you may need to get a more expensive bed. The other thing to keep in mind is that the sides, footboard and headboard are fairly solid. If your child’s crib had a bumper and your little one is used to banging his head against the side without consequences, he may get a bruise or two while getting adjusted to this bed. However, a child used to sleeping in a wooden crib should have no problem, and you can always pad the sides of the bed while the transition to the Kidkraft Modern toddler bed is being made. All in all, this is a quality toddler bed and worth what you pay for it.